Surrounded by pine trees and flower gardens, Pinehurst Inn Bed & Breakfast is one of the best places to stay in Bayfield, WI. This historic 8-room inn offers charming eco-friendly accommodations and provides unparalleled lodging near Lake Superior. It’s just minutes from many Bayfield, Wisconsin attractions yet is a calm, peaceful escape. Guests enjoy comfortable rooms, delicious 3-course breakfasts, and much more. Check out things to do in the area to plan your trip, then come see what makes Pinehurst Inn Bed & Breakfast so special. 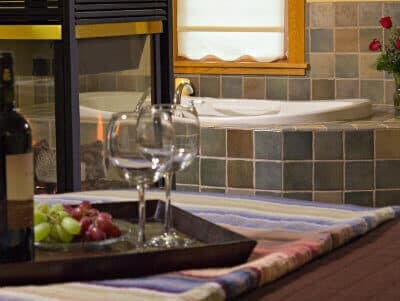 Pinehurst Inn Bed & Breakfast merges all the elements of the ideal Bayfield, WI lodging experience: serene location, soothing amenities to relax and rejuvenate, and close proximity to area attractions. It is the perfect location to enjoy a romantic getaway. Unlike other Bayfield, WI hotels, the B&B offers both the majestic Main House as well as the eco-friendly Garden House. The historic Main House, built in 1885, provides five guest rooms designed with guest comfort in mind. The Garden House, built in 2003 as a “green building,” complements the main inn both in design and spirit and includes three large high-end guest rooms, each with a king bed, large jetted tub and fireplace, and two with private decks that look over the perennial gardens and the secluded Pikes Creek Valley. Other guest amenities include a sauna, gorgeous gardens to wander, an afternoon snack, and soft drinks available throughout the day. Our Bayfield bed and breakfast is known for its delicious breakfasts made from some of the freshest ingredients, many of which are locally grown and sourced, to start your day off right! Regardless of the season, you’ll find a number of activities and attractions to experience during your stay at our Bayfield bed and breakfast. You decide how much or how little you want to do. The area, known as “the home of the Apostle Islands,” speaks to those who love kayaking, sailing and big water. There also are miles of trails, gorgeous waterfalls, and long stretches of sandy beaches to explore. Winter pursuits include both downhill and cross-country skiing, snowshoeing and dog sledding, and the famous Mainland Ice Caves. Madeline Island offers even more things to do. 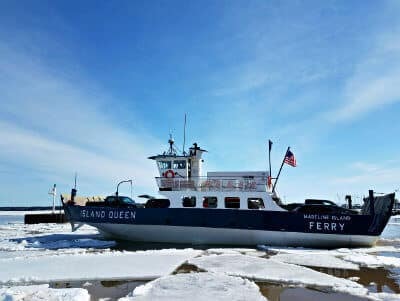 Take the Madeline Island Ferry across the bay to explore even more of what this area has to offer. And don’t miss the shopping at the various art galleries and unique shops featuring works of numerous local artists. Yet more than anything, this is the place for rest and relaxation. Believing it is the natural resources that bring joy to travelers and define us as a people, the Pinehurst Inn Bed & Breakfast has distinguished itself as a steward of the environment. 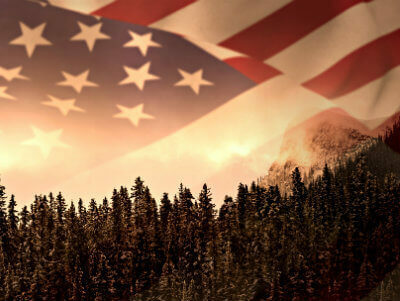 As an eco-friendly hotel in Wisconsin, we are committed to sustainability in our business practices. Our lodging in Bayfield, WI is a leader in the “Travel Green Wisconsin” program, and we are proud to be one of the most eco-friendly accommodations in the Apostle Islands area! If you’re in search of places to stay in Bayfield and the surrounding areas, Pinehurst Inn Bed & Breakfast is in the middle of it all, surrounded by islands off the coast offering endless opportunities. Escape to one of the top hotels and resorts in northern Wisconsin and enjoy the personal touch of our hospitality as you explore the many things to do in Bayfield, Wisconsin: the Apostle Islands, Lake Superior, Madeline Island, and the myriad of other attractions and activities of the area. We work hard to make sure all of our guests have a fantastic stay at Pinehurst Inn Bed & Breakfast. Please share your review of our inn on TripAdvisor by clicking the link below! Is there anything we could have done to make your stay better? If so, please contact us now so we can help! Spring is here and it looks like it is going to be a great Spring. The snow is melting, the temperature is rising, the ferry to Madeline Island is running, and we have had some incredibly sunny days. Start planning your Spring getaway today and don’t forget to check out our top five things to do in Bayfield this Spring. Find the perfect guestroom experience in either our Main House or Garden House now. Take advantage of our special discounts and enhance your stay with one of our packages. The Bayfield area has so much to offer. Plan all your must do activities while you are here.